The 4x800 qualifying standard for the Penn Relays is only 10:00, but only 35 teams from large schools are accepted. 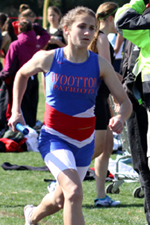 The girls from Wootton did not record an official 4x800 relay time for the entire indoor track season, primarily because Jessie Rubin and Andrea Maxwell did not compete on the indoor track team. In their first dual meet, they ran 9:47.9, a time that may or may not be good enough to be accepted. The Cougar Relays at Quince Orchard High School gave the team one more opportunity for a fast time before the Penn Relays registration deadline on Monday, March 29. 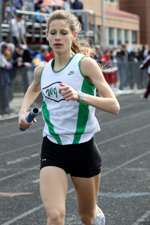 Corinne Duvall brought the team through in third place in about 2:27 while the team from Walter Johnson took a commanding lead on the first lap with a split of 2:22 from Anna Bosse. Jessie Rubin made up the five second gap over the first 400 meters and worked on extending her lead by two seconds with a total split of about 2:19. Andrea Maxwell ran all alone and split 2:22 before Grace Corbett brought it home in 2:21 for an overall time of 9:30.5. It was a new meet record by 17 seconds. The time is the eleventh fastest time by a county team in the last ten years (one time per team per year). The team from Walter Johnson also nipped the previous meet record by 0.2 seconds with a time of 9:47.4. 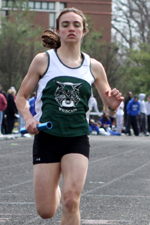 Just a short time later, Rubin faced off with Camille Bouvet of Walter Johnson in the 1600. Bouvet had not run in the 4x800 relay and led for the entire race while Rubin tried to keep pace behind her. The two came through the first 800 meters in about 2:40. Bouvet pushed the pace all the way to the end, finishing in 5:12.9, a personal best by over six seconds. It is the 20th best by a county athlete over the last ten years. Rubin was never able to make a move into the lead and finished second in 5:14.4. The Wootton girls ultimately won the meet with 72.50 points, over thirty more than the next best team. The team also placed second in the sprint medley relay, second in the 4x400 relay, and third in the 4x100-meter shuttle hurdle relay. Freshman hurdlers Gwen Shaw and Sylvia Deppen placed second and fourth in the 300-meter hurdles in 47.3 and 49.5 respectively. Shaw, who beat out Quince Orchard's Shannon Dwyer head-to-head, was the top county finisher in the event. Elaine Chen was second in the long jump (15-01.00). The Quince Orchard girls won 100 shuttle hurdles in 1:09.9, just shy of the meet record by 0.2. The time ranks #5 last by a county team in the last five years. Anna Ryba of Whitman came back from winning the Devil Takes the Hindmost in 29:13.8 to place third in the mile in 5:28.9. I was not able to make it to the meet on time to see the Devil Takes the Hindmost, but I heard it was a good race. Feel free to discuss it in the forum or the article comments. The WJ girls won the DMR by about 27 seconds with a time of 12:50.9, which ranks #7 by a county team in the last five years. Jennifer Spencer led off in 3:59, Jenna Willett split 63, Bouvet split about 2:27, and Bosse brought it home with a split of 5:21. The Northwest girls put together strong performances in the relays without two of their top runners, Olivia Ekpone and Alyssa Henshaw. The team broke the meet record in the 4x400-meter relay with a time of 4:02.4. They just missed the meet record by 0.4 second in the sprint medley relay when they clocked 4:17.7. Northwest appeared to be on pace to break the 4x200 meet record of 1:45.1 before their anchor leg, Camry Torian, appeared to pull her hamstring. She hobbled home in 1:52.2 while the anchor leg from Gaithersburg blew past her for the win in 1:47.5. Torian may be out for several weeks according to Coach Dave Knight, who prefers to play it safe when it comes to injuries. Ekpone did not run because she was sick earlier in the week and will compete in the U.S. Area Youth Olympic Selection Trials in Arlington, Texas next week. The Good Counsel girls held off Gaithersburg in the fourth section of the 4x100 to win in 50.2. Gaithersburg finished in 50.6 while Paint Branch finished second overall out of the third heat in 50.5 with an awesome come from behind anchor leg by Jasmine Jones. The Clarksburg girls swept the jumping relays with three girls: Charnay Ryland, Bailee Freeman, and Cassidy Pickles. Ryland had the top marks in the long jump (15-09.50) and triple jump (34-02). Pickles and Freeman tied four other girls for the best high jump of the day, 4-10. Virginia Owusu-Mainoo nd Xiomara Portillo of Seneca Valley won the discus relay with throws of 82-03 (2nd) and 74-04 (4th) respectively. Owusu-Mainoo's mark of 82-03 tied Holton Arms's Juju Obioha for the county lead so far this year. Leah Lang teamed up with Dashawn Herbert-Williams to win the shot put relay. 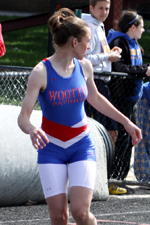 Leah Lang had a county-leading third place throw of 33-09 while Herbert-Williams threw 29-08.
wootton girls had a great start to what looks to be an impressive season... that 4x800 is only going to get better! where was churchill? why didn't they compete?